Easter is a very important time of year in Irish history. In addition to the obvious religious implications for a land so steeped in religion --- something which has resulted in both good and bad things -- Easter is the time when the modern state of Ireland was born. It was born in rebellion and violence and much destruction and bloodshed. It was born in failure. Stillborn, in a sense. 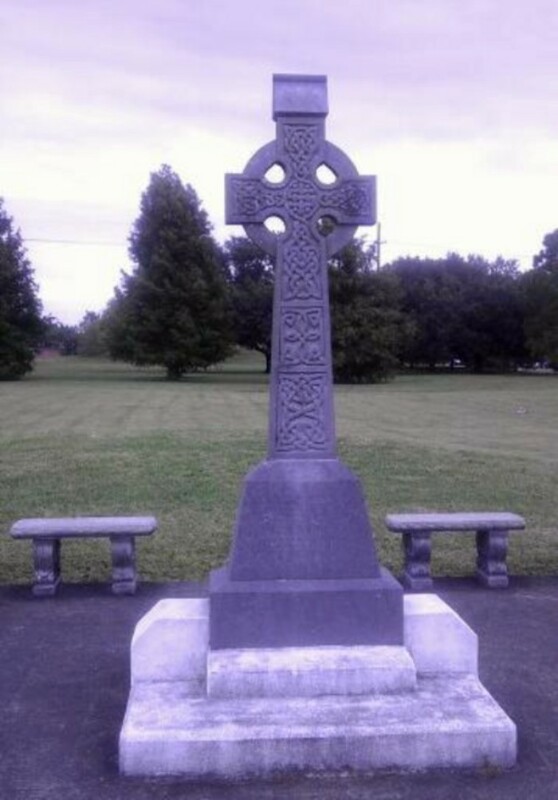 But resurrected just a few years later, in 1919 to 1921, in yet another Irish rebellion and war. 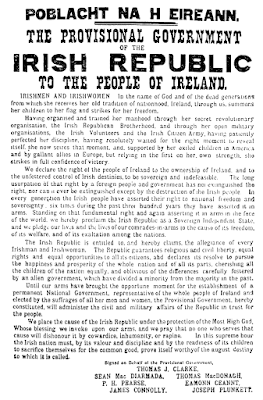 This time the birth was for real and an Irish Free State resulted which eventually led to the Irish Republic of today. 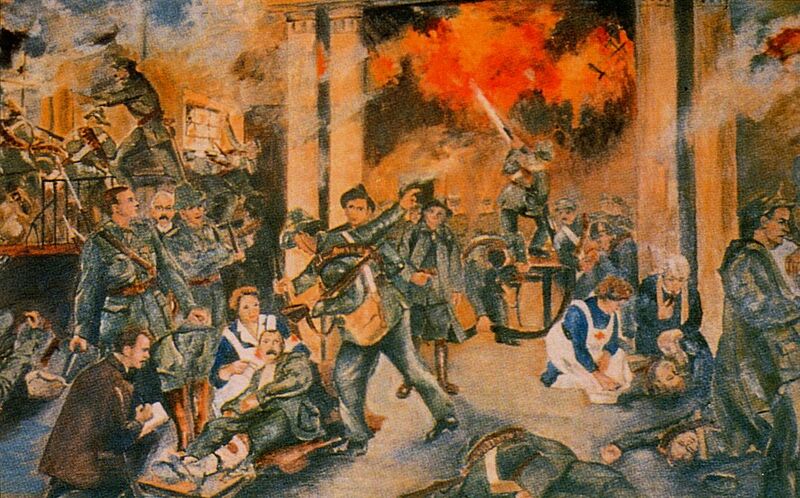 In the Easter Rising of 1916 Irish revolutionaries fulfilled the defeated dreams of the Irish rebels from the doomed Rebellion in 1798, The Year of the French. 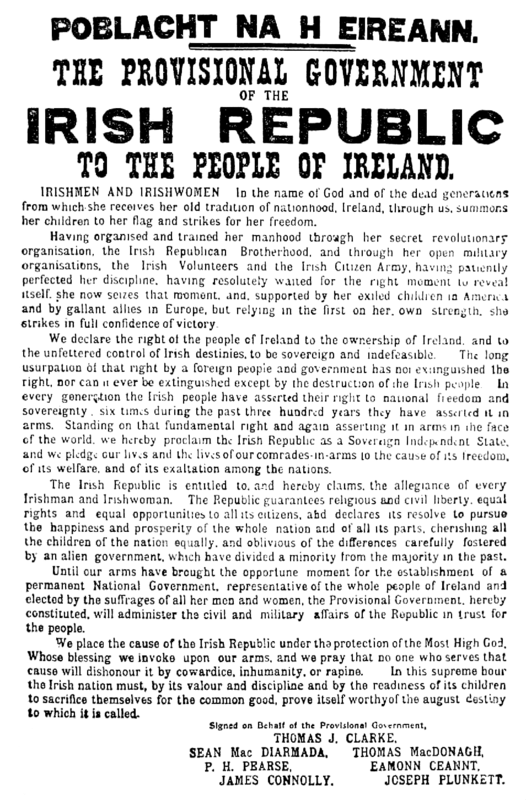 For centuries the Irish struggled for freedom from Great Britain; but with 1916, though it was a failure in itself, the rising brought about the War for Independence which won freedom for the Irish nation. In this sense "a terrible beauty was born" in 1916. The great poet William Butler Yeats would use that phrase in his poem, "Easter, 1916," to describe the birth of modern Ireland. 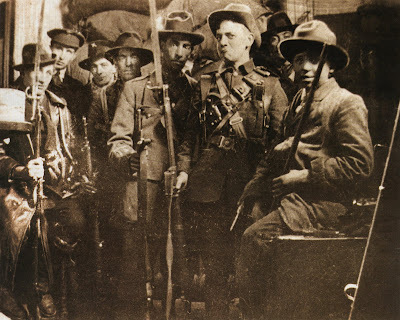 In April, 1916 (specifically on Easter Monday, April 24) while World War I was still raging a force of largely unprepared and ill-equipped Irish rebels seized by force of arms several buildings in the city of Dublin and proclaimed an independent Irish Republic. Part of the reason the Irish rebels were so ill-equipped was because a shipment of weapons from Germany intended for the rebels had been seized by the British Navy. Because of this the rebellion should have realistically been cancelled, but it went on nonetheless to its doom. from Britain. A type of "Declaration of Independence"
The British sent in an army and proceeded to shut down the rebellion with artillery fire and machine guns, and even war ships. Since Britain was already at war with Germany, it was not hard to image that the British would not hesitate to use massive force against an armed insurrection in its own backyard. The Irish public did not at first fully support the rebellion. In fact many Irish men were serving in the British Army at this time fighting the Germans in the trenches in France. So, supporting a rebellion might be seen as aiding Germany. Something called the Irish Republican Brotherhood instigated the rebellion, and its troops were from something called the Irish Volunteers and the Irish Citizen Army. They were led by poets and school teachers and other citizens who were basically incapable of taking on a British Army already experienced in fighting major wars. Nevertheless, the rebels were serious despite being hopeless. The Irish men also had a women's auxiliary called the Cumann na mBan, or women's council, whose members acted in supporting roles typically as nurses, medics, and messengers and couriers, although some carried guns. The main fighting took place at the General Post Office which the Irish rebels held for awhile. But within six days the Easter Rising was crushed by a vastly superior British military force. 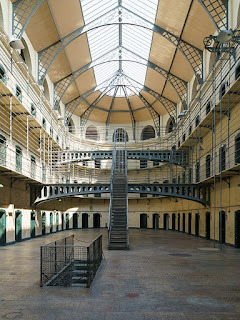 The leaders of the Irish rebels were arrested and sent to Kilmainham Gaol (or jail) in Dublin or to internment camps. The British executed many of the revolutionaries by firing squad. 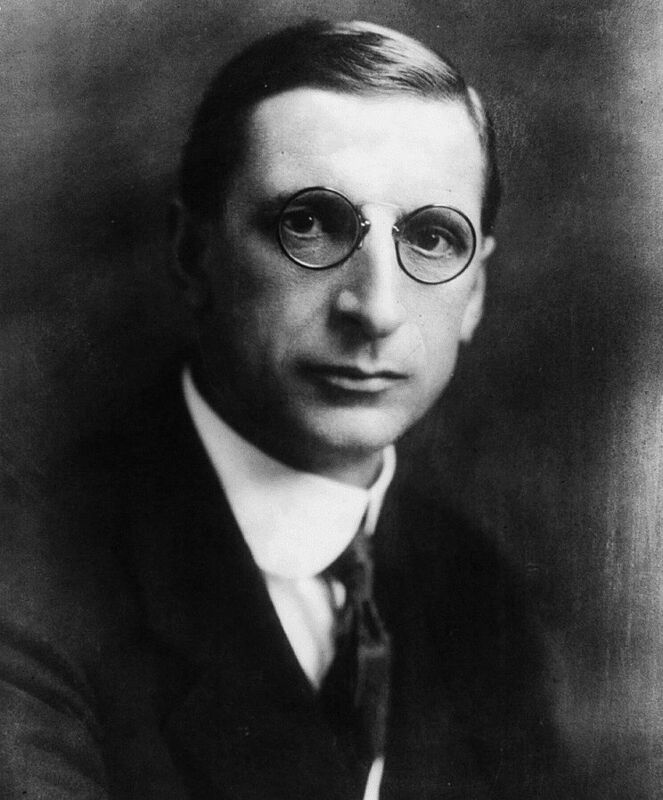 They did not kill the man who would become the first president of modern Ireland, Eamon de Valera because he was actually an American citizen, having been born in Brooklyn, New York. The British did not want to create an unpleasant incident with the neutral United States with a world war going on. After all, the British might need America's help sooner or later during the Great War. 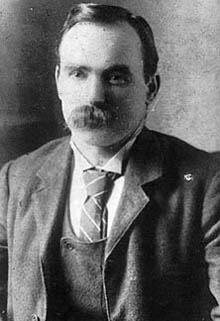 Some of the more famous names of the Irish leaders are as follows: James Connolly, a wounded socialist rebel whom the British infamously tied to a chair, since his wounds prevented him from standing, and then used a firing squad to shoot him to death with rifle bullets. 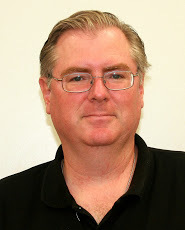 Thomas McDonagh, a school teacher. Patrick Pearse, was a teacher and Irish language advocate. (He wanted to revive the use of the ancient Irish Gaelic language.) 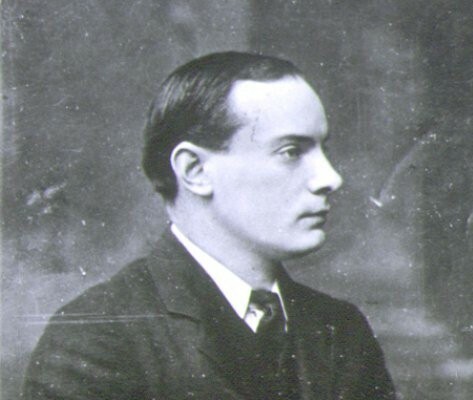 Pearse was noted for a statement, famous in Irish history: " .. they [the British] have left us our Fenian [rebel] Dead, and while Ireland holds these graves, Ireland unfree shall never be at peace." The British shot him to death. 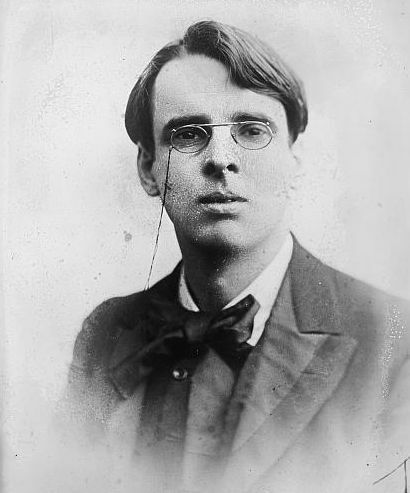 The great poet William Butler Yeats wrote a poem about the rebellion called "Easter, 1916." He described the scene in Dublin and the epic nature of the fighting. 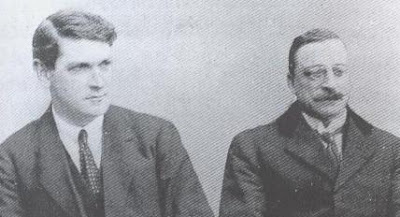 Irish rebel prisoners in a British jail, awaiting trial. At the end of his poem, Yeats lists some of the leaders who were executed and creates the phrase which perfectly depicts the nature of the new nation -- modern Ireland -- composed of both a positive and a negative term, as only a great poet can do -- "a Terrible Beauty." 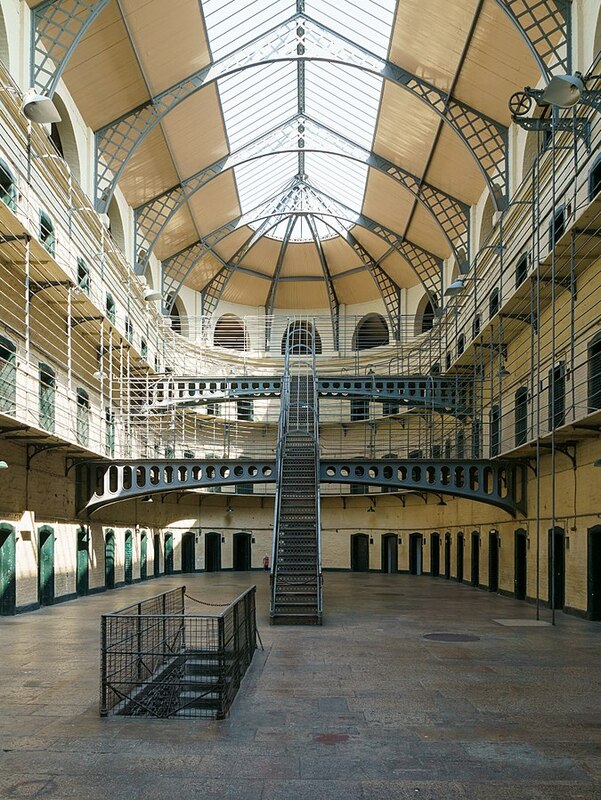 The British eventually arrested and jailed over 3000 Irish after the failed rebellion. Most of the Irish leaders were put to death. The harshness of the British suppression, however, backfired politically. It simply made the Irish public, which earlier was not supportive of revolution change their minds and become more sympathetic to future rebellion. A future rebellion did occur with the Irish War for Independence or Anglo-Irish War in 1919 to 1921. Sinn Fein (Ourselves Alone) movement for Irish freedom. 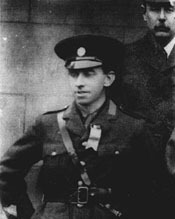 Its new leader was a young man who had played a rather minor role in the Easter Rising, who was jailed but later released. He was, however, to play the main role in the war which won freedom for Ireland. His name was Michael Collins. He was the leader of the Irish Republican Army, the original IRA. Collins brilliantly used guerrilla tactics and a hit-and-run strategy to defeat the vastly larger and much better supplied and equipped British military. Michael Collins is one of the greatest heroes in all of Irish history. Yet, Collins tragically was assassinated, after securing a peace treaty with the British and partial independence. He was only 32 years old when he died. No one knows who killed him, although it is suspected the assassins were other Irish who opposed the peace treaty he secured with Britain. The IRA, in effect, broke into two parts after the peace treaty, one group supporting it, the other opposing it. 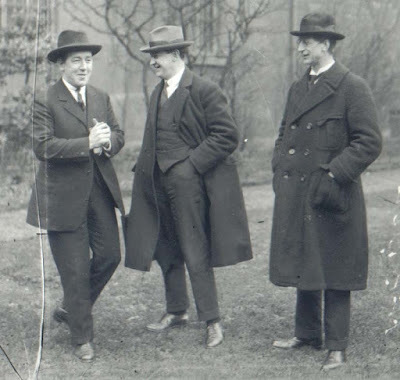 The opposing group felt the treaty did not go far enough in gaining full Irish independence since the North (Ulster) remained a part of Britain, and other limitations were made on full independence. Collins saw the treaty as a "stepping stone" to greater independence later on and the best possible deal available under the circumstances. 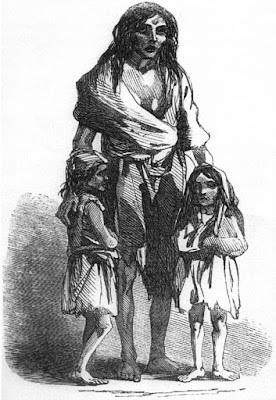 The Irish populace supported Collins. 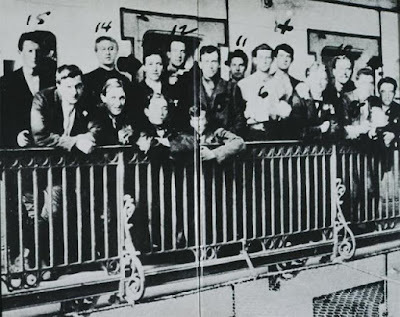 Easter, 1916 started a very bloody and traumatic time for the Irish in Ireland and those Irish in America who were concerned about Irish freedom and Ireland's future. The Irish fought the British for independence; and later on the Irish fought the Irish in an Irish Civil War, brother against brother, over the peace treaty with Britain. The viciousness and the significance of the fighting throughout all of those bloody years was exactly as William Butler Yeats described it. Easter,1916 created A Terrible Beauty.